Pfc. Douglas W. Kearney during World War II. WASHINGTON (Army News Service, Nov. 20, 2008) – Although the honor was bestowed more than six decades later, for one World War II veteran his service has not been forgotten. Former Pfc. Douglas W. Kearney, 85, was awarded the Bronze Star Medal Nov. 12 in his hometown of Milford, Conn., by retired Lt. Gen. Russel L. Honoré in a ceremony at the Milford City Hall for meritorious achievement in combat. During the search, Kearney found that her father served with Headquarters, 17th Armored Infantry Battalion, 12th Armored Division in campaigns throughout northern France, Rhineland and central Europe, including the D-Day invasion of Normandy. 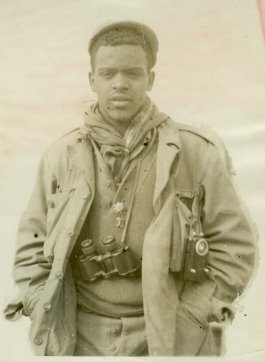 Douglas Kearney was drafted into the military through the selective service process and was placed with a black unit out of Massachusetts, said Dr. Kearney. He was transferred to an integrated company with the 17th Armored and later deployed. The award comes as the Army marks the 60th anniversary of desegregation of the U.S. military this year. 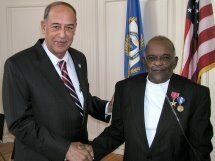 Kearney also received the Connecticut Veterans Service Medal presented by the State of Connecticut Department of Veterans Affairs. He also served as grand marshal of the Milford Veterans Day Parade. The Bronze Star Medal came about thanks to the help of Lt. Gen. Honoré, said Dr. Kearney. She serves as the executive director of corporate responsibility at Gallup. Honoré, who retired as the commanding general of First Army based at Fort Gillem, Ga., now works as a senior scientist with the company. She mentioned her father’s service to the retired general and Honoré made the request on her father’s behalf…. Kearney said she hopes that more veterans who served with her father during World War II will receive recognition for their service as well. Milford resident Private First Class (PFC) Douglas W. Kearney remembers landing on the beach at Normandy, France, in 1944, and luckily avoiding gunfire that killed or wounded many of the servicemen who stormed the beach that day. “We landed with a half-track,” Kearney said this past week at City Hall, where he was honored with a Bronze Star for his military service. He was a gunner aboard the military vehicle, whose caterpillar tracks propelled it over the sand, and he said he put his faith in God as he and his company made their way through a battleground littered with casualties — 90,000 in one day. Decorated Retired General Russel L. Honoré,…heaped praise on Kearney and his family — a Bridgeport family that had a history of service to their country in WWII. The late Mary Frances Kearney, Douglas’ sister, was one of the members of the first all-black Women’s Army Auxiliary Corps (WAAC) and eventually received several ribbons and medals for her military service. The late William H. Kearney, Douglas’ brother, was a surgeon and captain in the 368th Infantry, honored for bringing aid to survivors of an airplane crash and supervising their movement from a mountainside after administering emergency treatment. “Here’s a family represented to date by our hero, for which we stand here today as a free country,” Honoré said as he pointed to Kearney. “We’re blessed by their service to this country. AND, there is a very cool site about African Americans in the US Army. My long time readers know I have written about these heroes before, but on this site they have a whole section called “Profiles of Bravery.” Take the time to go read this site here. The Kearneys are an amazing family, with many stories of service to share with us. It is NEVER too late to say: Thank you for your service, Pfc Kearney!